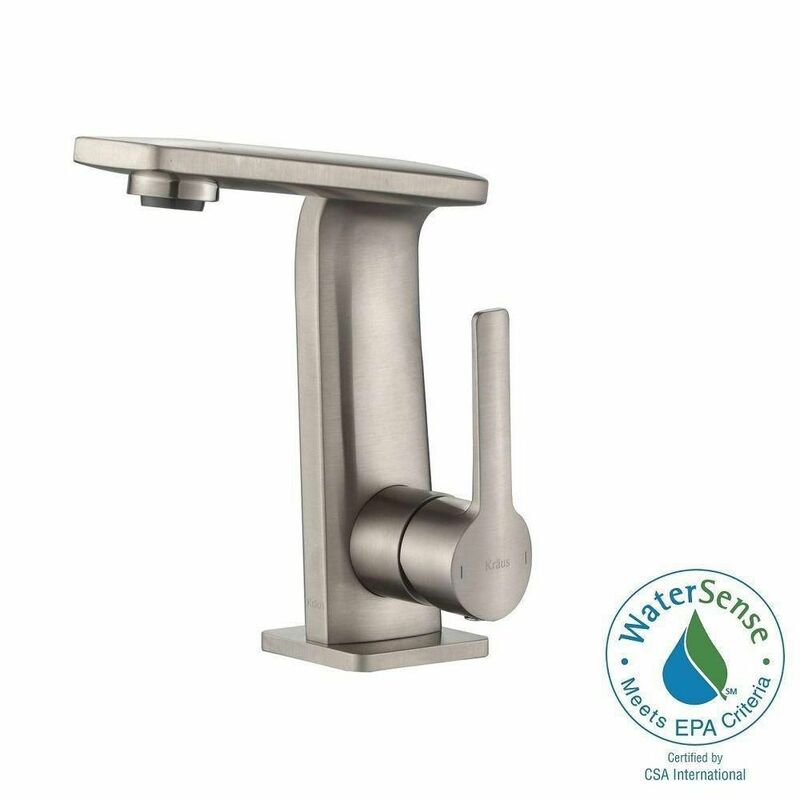 Novus Single Hole 1-Handle Mid Arc Bathroom Faucet in Brushed Nickel with Lever Handle Give your bathroom a new look and feel with this piece from Kraus. Finish up your bathroom remodel with this beautiful single-control faucet. Its deck mounted design makes it easy to set up and looks great with many sink types. This WaterSense certified faucet uses less water but gives you the same clean every time. Novus Single Hole 1-Handle Mid Arc Bathroom Faucet in Brushed Nickel with Lever Handle is rated 4.8 out of 5 by 12. Rated 4 out of 5 by G85 from Very nice faucet..... Very nice faucet.. Rated 5 out of 5 by AmHappy from Gave our upstairs bathroom a much needed update. Installed a new floating vanity with this Kraus... Gave our upstairs bathroom a much needed update. Installed a new floating vanity with this Kraus faucet. Looks fantastic. Plummer who did our pipe updating was very in impressed with the quality. Have just purchased the vessel sink version of this faucet for our future powder room redo. Rated 5 out of 5 by 2ThumbsUp from Beautiful modern faucet!... Beautiful modern faucet! Rated 5 out of 5 by Julie from Simple yet stylish désign. Great water flow. Easy... Simple yet stylish désign. Great water flow. Easy installation. Nice packaging. Rated 5 out of 5 by Ruth from This is the most gorgeous faucet I have ever seen.... This is the most gorgeous faucet I have ever seen. I really wanted a faucet that did not have a handle on top of the faucet to reduce the water and soap spatter on the top. This one is perfect!!!! We are using in an event space bathroom and it looks great!